Caroline F. Ware, a professor of history at American University and a New Deal activist edited The Cultural Approach to History, featuring an array of distinguished historians including Merle Curti, Ray Allen Billington, Constance Green, Ralph Gabriel, and Ware herself. The cultural approach Ware advocated attempted to shift the focus of historical analysis from institutions and elites to social realities among Americans often lost in the story of the nation’s past. It placed heavy emphasis on social and economic context, explicitly recognizing the diminishing roles of individuals in the modern industrial world. And it stressed the interdependence of social, economic, and cultural forces. Only by delineating the “total structure of society” would historians be able to assess the significance of individuals, ideas, and events. Yet for Caroline Ware, The Cultural Approach to History was less an inspiration to pursue new areas of study than an affirmation of her own historical research. For nearly fifteen years, Ware had been struggling to broaden the focus of historical analysis by incorporating industrialism and the experiences of the working class. 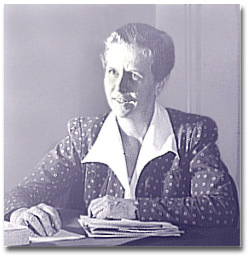 From her doctoral dissertation on “The Industrial Revolution in the New England Cotton Industry,” prepared in 1925 and published as The Early New England Cotton Manufacture, to her innovative study of Greenwich Village published in 1935, Ware worked to advance historical understanding of the “inarticulate.” The forces that shaped their lives had stood at the center of Ware’s intellectual agenda long before the American Historical Association formally unveiled the “cultural approach to history” in 1939. The Early New England Cotton Manufacture was one of the most important historical studies of industrialization written in the early twentieth century. Ware’s study of Greenwich Village explored in an ethnically diverse urban community what Helen and Robert Lynd pursued in their classic portrait of Muncie, Indiana—Middletown. 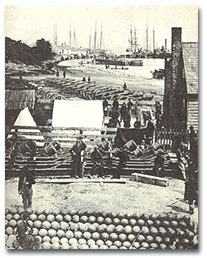 Photograph by Mathew Brady of the lower wharf at Yorktown, Virginia, 1862. From The Cultural Approach to History. Thus Ware’s 1940 call for history written “from the bottom up” had already been partially answered by her previous research. “American culture,” she once observed, “has never assimilated industrialism.” That was a reality Ware attempted to redress in her historical work. In so doing, she found reflected in the nation’s past the roots of problems that vexed her generation. Caroline Ware also anticipated many of the historical questions that would animate a generation yet to come. The origins of Ware’s innovative intellectual concerns reached back to the early years of her life. Born on August 14, 1899, in Brookline, Massachusetts, Caroline was the first child of Henry and Louisa Ware. 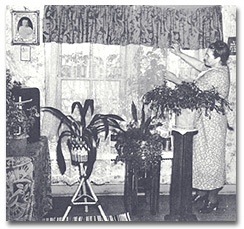 The Wares were an old and distinguished New England family with enduring ties to Harvard University. Caroline’s “great-great-grandfather” had served as a professor at the Harvard University Divinity School; her father was a lawyer and municipal judge who had attended Harvard College and Harvard Law School. There was a long tradition of civic activism in the family history, and it was carried on by both of Caroline’s parents throughout her early life. The top of the hill was where the professional people lived, the business people; the bottom of the hill was where artisans and the laboring people lived. The top of the hill was Republican, Protestant, with very few exceptions; the bottom of the hill was Irish and Catholic, with very few exceptions. Educated in private schools, Ware was nonetheless a “tomboy” who observed these class distinctions firsthand in her many forays around the neighborhood as a young child. Ethnic and cultural diversity, as well as social and economic hierarchy, were thus readily observable facts of life in the community where Caroline Ware was born and raised. The living room of a Michigan iron miner, 1937. From The Cultural Approach to History. Ware’s Vassar College experience added another important dimension to her intellectual development by reinforcing family “service” ideals. Although the message had been diluted somewhat from the founding days, women’s colleges such as Vassar continued to remind students of their social responsibilities. During the summer of her junior year, Ware explored her growing interest in social work as an intern for New York’s Community Service Organization. Her summer internship turned Ware away from social work and toward an academic career. “Education,” she concluded, “was more fundamental.” Still the home visits to immigrant and poor neighborhoods enlarged Ware’s understanding of the urban environment and deepened her sensitivity to class divisions. She was shocked to discover that poverty cut across ethnic and racial lines. The slums she encountered were full of “fair haired, blue eyed” men and women much like herself. This recognition shattered Ware’s assumption that poverty was a problem restricted to New York’s immigrant community. No solid undergraduate history education would have failed to expose a student of Ware’s generation to the works of Turner and Beard. It was the intellectual ferment stirred up by the “Progressive historians” that made American history such an exciting field of study in those years. Turner had added fresh meaning to the ambitions of the new history in rebelling against the institutional slant of historical study. Through his focus on the West, Turner posed imaginative and stimulating questions about the character of American society. He searched in new places—geography, economy, social development—for an interpretation of U.S. history that stressed the interconnectedness of the multiple forces shaping America’s past. 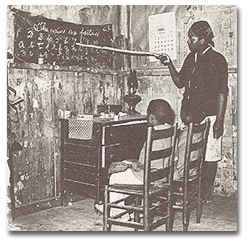 Mother of a sharecropper family teaching her children in their home, 1939. From The Cultural Approach to History. Ware’s history of The Early New England Cotton Manufacture brought together the various ideas that had informed her intellectual apprenticeship in an extraordinary way. The comprehensive scope of The Early New England Cotton Manufacture alone set a high standard in American social history. Ware offered her book not simply as an economic history of a local industry but as a regional study that illuminated a process that would transform the United States. Unlike traditional institutional history, it combined analysis of large-scale economic trends with careful assessment of the human and social costs of industrial growth. The motives and methods of entrepreneurs stood side by side with the struggles and strategies of the workers they employed. This was an important departure from many other industry-centered economic histories. It also presaged the interest of future labor historians in class formation and the culture of industrial work. Ware’s study was also innovative in its treatment of gender, which surfaced as a category of analysis in her discussion of Lowell’s mill girls. The attention to gender was significant not simply because women were integrated into the history of industrial work. (Edith Abbott had achieved this nearly twenty years earlier.) Rather, Ware analyzed gender as a dynamic force in the cotton industry. She explored the convergence of manufacturers’ interests, market conditions, work culture, and women’s lives. 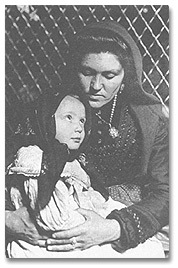 Italian immigrant mother and child. 12,000 immigrants passed through Eillis Island the day this photograph was taken. From The Cultural Approach to History. Her research on The Early New England Cotton Manufacture earned Caroline Ware her doctoral degree and great respect in the historical profession. Her years of work on the cotton manufacture also led Ware to the most meaningful personal attachment of her life—her relationship with her future husband, Gardiner Means. Enrolled in business courses at the university, Means lived in the same apartment building as Ware, across the street from Widener Library. A pilot during World War I (he had the top bunk above Adolf Berle in basic training camp), Means had worked in a small textile business in Lowell before coming to Harvard. The couple married in 1927, but Ware decided to keep her own name. Not long after earning her doctoral degree, Ware secured an academic position at Vassar College. She relished Harvard’s response to the query from Vassar’s history department about suitable candidates for the job. “The logical candidate is your own Caroline Ware.” While Ware was teaching at Vassar, Means undertook research in economics at Columbia Law School while earning a Ph.D. in economics from Harvard. In a book coauthored with Adolf Berle, The Modern Corporation and Private Property, Means explored the concentration of economic power in the United States. Setting aside her own work in economic history, Ware’s interests shifted to ethnicity and community life. The direction of Ware’s new research reflected her continuing involvement with workers’ education. The rise of cultural anthropology undoubtedly left an imprint on the historian, as well. But Ware herself remembered the tremendous impact Middletown had on her thinking about American society. Published in 1929, Helen and Robert Lynd’s study probed the “interwoven trends . . . of a small American city.” The Lynds were searching for the changing character of the United States. They presented their investigation of Muncie, Indiana as “a study in modern American culture.” “I was,” Ware recalled, “enormously impressed.” Middletown seemed “a great way to look at society.” But Muncie was a city in the heartland of the United States, a relatively homogeneous community in many ways. “What about these other communities where there is enormous diversity,” Ware asked herself. The opportunity to pursue that question arose in 1931. Columbia University’s Council for Research in the Social Sciences had decided to conduct a community study of Greenwich Village. Ready to take leave from Vassar, eager to join her husband in New York, and already engaged in immigration research, Ware agreed to direct the Columbia project. Her year away from Vassar stretched into two as Ware and her staff conducted their investigation from an office on Jones Street in the village. In 1935 Ware’s interpretation of their findings was published under a title that evoked the mission of the Lynds: Greenwich Village 1920-1930: A Comment on American Civilization in the Post War Years. 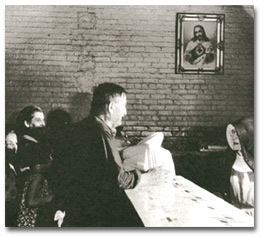 St. Anthony’s soup kitchen in Hoboken, NJ, 1940 From The Cultural Approach to History. Most of all, Greenwich Village reflected Ware’s persistent intellectual concerns in its attempt to reveal the working class and ethnic soul of the New York neighborhood. Ware’s Greenwich Village was not “a story . . . of ‘long-haired men and short-haired women,’ artists and pseudos, speakeasies, night clubs, and haunts” but a place of “Italian immigrants and their children, Irish longshoremen, truck-drivers, and politicians, Jewish shopkeepers, Spanish seamen, and a remnant of staid old American and German citizens.” Her innovative perspective on the determinants and characteristics of modern urban life resulted in a rich assessment of the Village, one that competed with romantic and stylized versions of the Bohemian neighborhood. Ware found a culture framed less by poets than by ethnicity and the experiences of a diverse working class. For Ware, “extreme urbanism” seemed to bring with it “imperviousness to human contacts.” A “rampant individualism” flourished in twentieth-century American cities finding “outlets” only in “predatory action or escape.” There could be no “social development,” Ware stressed, without “a coherent social life.” Where would “organizing [social] forces” come from that could provide a basis for a vibrant community? That question was left hanging in Ware’s rich and complex assessment of modern urban development. Her depression era “comment on American civilization in the post-war years” offered little room for optimism about the direction of cultural life. It would be many years before American historians explicitly embraced the intellectual imperative laid down by scholars such as Ware. Not long after the publication The Cultural Approach to History, the United States entered World War II. After the war had ended, many American historians returned to celebrating the “democratic” ideals embodied in the radon’s past. Ware herself turned her attention to other matters in the late 1930s and 1940s, advancing consumer programs through government service during the New Deal and World War II. Though she kept her hand in academic life, beginning a long career teaching at Howard University in 1942, Ware’s interests after the war shifted primarily to international development, social work, and other contemporary issues. 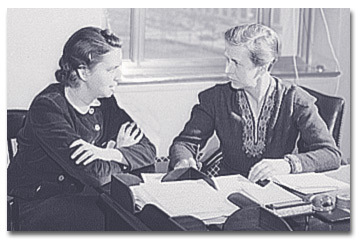 Caroline Ware with a research assistant while serving in the New Deal Office of Price Administration. No cadre of graduate students existed to carry on Ware’s work and reputation as a historian. She had spent her most productive years in the discipline at a women’s college. Ware left her mark on a new generation of students in the history and social work classes she taught at Howard. As the years passed, however, less time was spent on historical research and writing, with one notable exception. In the late 1950s, Ware devoted great energy to coauthoring and editing a volume of the United Nation’s History of the Cultural and Scientific Development of Mankind. Along with Dutch historian Jan Romein and Indian historian K. M. Panikkar, Ware surveyed world history in a sixth volume simply but boldly entitled, The Twentieth Century. The work was encyclopedic, but Ware’s attachment to the cultural history agenda emerged clearly in the sweeping account of modern historical trends. The U.N. project was wracked with political dissension throughout, most notably when the Russian delegation to U.N.E.S.C.O. objected to the treatment of Marxism in volume six. (Other scholars bemoaned the book’s insufficiently critical treatment of communism.) By the time the book appeared in 1966, Romein and Pannikar were both dead. Although Ware saw the work to fruition, at sixty-seven she would not publish in the field of history again in spite of remaining intellectually active until her death at ninety in 1990. To be sure, the thrust of “the cultural approach” persisted in some American social history written during the 1940s and 1950s. With less fanfare, significant strides were made by scholars who addressed the challenge of enlarging the scope of historical study. The more modest ends stated in The Cultural Approach to History—to suggest new approaches and materials, to provide some provocative examples—were achieved by the volume itself. Less enduring was the common and unified sense of purpose The Cultural Approach to History seemed to promise and announce. When a younger generation of scholars took up the challenge of the “new social” and “new labor” history in the 1960s and 1970s, they contrasted their efforts with a traditional history focused on formal politics, institutions, and elites. The divergence was, in fact, an important one as the new, “new history” (whether social or labor) moved the study of American society in imaginative and fresh directions. Innovative conceptual models and powerful methodological tools uncovered a world of experience that enriched knowlege of the past. Yet the interpretive model overarching this work reflected little, if any, recognition of the 1930s “cultural approach.” Labor historians such as Herbert Gutman carefully noted that the distinction between the “old” labor history of John R. Commons and the “new” labor history was overdrawn. He explicitly acknowledged the pioneering accomplishments of historians such as Caroline Ware. Still, the rhetorical distinction persisted, hardening into a version of American historical writing that abandoned a significant moment in the historian’s past. Honored at a Smith College conference devoted to the history of New England’s working class in 1979, Caroline Ware expected to “feel old bat, a voice out of the past.” Instead as she listened to the “path-breaking” scholarship being done in labor history she was struck by “how completely at home [she] felt.” It is little wonder that Ware felt a sense of belonging among practitioners of the new labor and social history. The paradigm for cultural history she created anticipated many of the concerns animating contemporary historical work. Many historians, however, have tended to overlook that fact. — By Ellen Fitzpatrick, abridged from American Quarterly, volume 43, 2 (June 1991). Caroline Farrar Ware came from a prominent Unitarian family with an activist tradition.